Last week I took my students to see a video installation by Saskia Holmkvist, a Swedish artist who has done a series of works on role distribution and power (no it’s not Saskia on the picture). One of her installations, called In Translation, deals with different roles in interpreting. 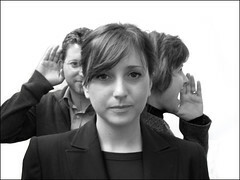 In the installation, Saskia interviews two interpreters with their clients’ present. It is a Norwegian public service interpreter and Latvia’s former president’s interpreter. The interviews are short and deal with interpreting techniques and different issues in interpreting. The installations are interesting from many different perspectives, though. First of all, the clients’ reactions when they were put outside the conversation. The minority language speaker in the first interview seems to completely disconnect from the communicative event, after a couple of minutes he is more interested in the camera than in the interview. I cannot help to speculate whether it reflects his earlier experiences of different interpreted communicative events, where at different occasions he may very well have been (unintentional or not) disconnected from the communicative event, and if he is used to it, he has also learned to deal with it. Another factor is also of course the asymmetric distribution of power in these types of interpreted events. This client hardly has any comments on his interpreter’s performance either. All this is absolutely not to say that the interpreter is not good, on the contrary, the interpreter comes through as very professional and impartial. In the second interview the client has a completely different role, but now we’re talking about Latvia’s former president and his personal interpreter. This client is not waiting silently on the side. When he realizes that he is not part of the communicative event he jumps in with comments and statements. He will not silently sit beside the communication, even if his perspective is the users and he does not have any experience as interpreter, he still has many views on interpreting. His most interesting comment is probably the last one – something like; “The interpreter should not reflect on what I say, even if she doesn’t understand she should know I always have a goal with what I’m saying”. The relationship between this interpreter and this client is far from impartial, and she also says it, when she represents Latvia (through her president) she wants Latvia to look good. Body language and spatial placement also shows that there is a more symmetric relationship between interpreter and client. If the video installation comes anywhere near you it is definitely worth watching. There is more information here in Norwegian.